Stožice Stadium is the largest purpose built football ground in Slovenia with a capacity of 16,693, and is one of two venues used by the national football team. 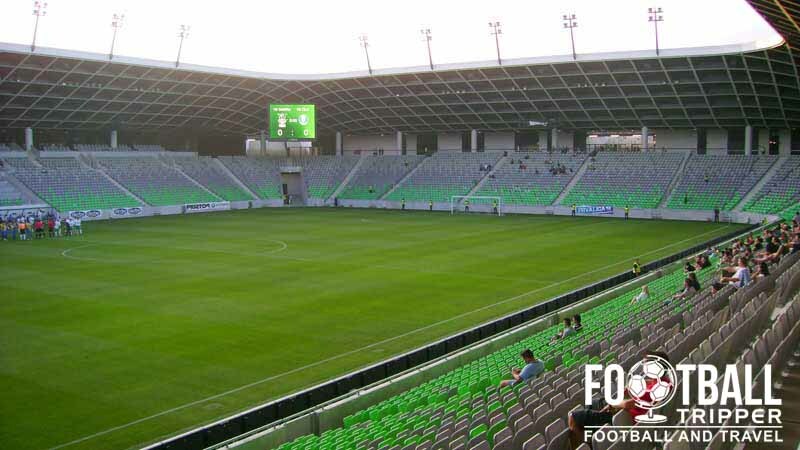 It is also home to NK Olimpija Ljubljana who compete within the Slovenian PrvaLiga. The inaugural football match was held on 11th August 2010 between Slovenia and Australia, a day after the opening ceremony was held. 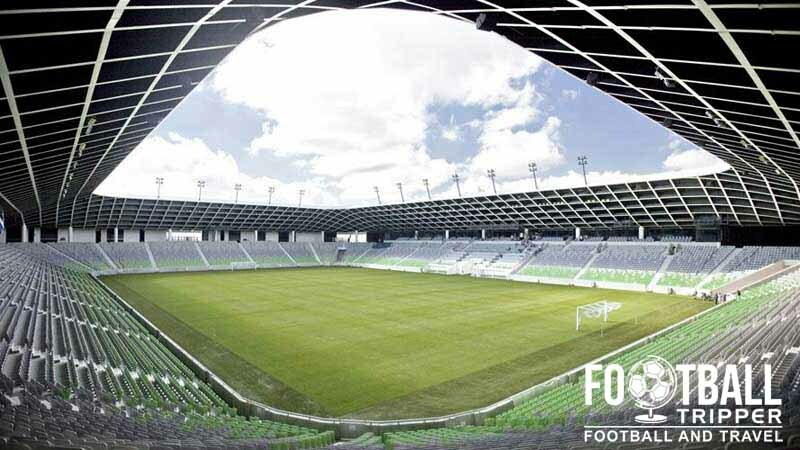 Attended by 16,155 supporters, the opening match not only set the attendance record for Stožice Stadium but also the record for Slovenia National Team which formed after the country’s independence in 1991. Designed by Sadar Vuga architects, Slovenia’s national Stadium forms part of the Stožice Sports Park which also contains facilities for every other national sports with the exception of ice hockey. Capable of seating just over 16,500 supporters for sports events, and around 20,000 for concerts, the stadium is famous for its sunken design which results in a low profile which is sometimes described as a “monolithic crater” or a volcano of sorts. 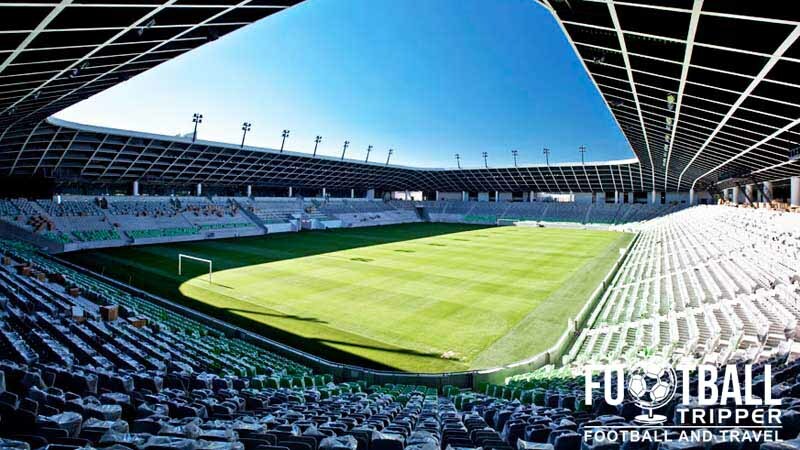 Constructed between 2009 and 2010, Stožice Stadium first came to prominence when it held three of Slovenia’s qualification matches of Euro 2012.It has since continued to share hosting duties with several other stadiums in the country including Maribor’s Ljudski vrt. 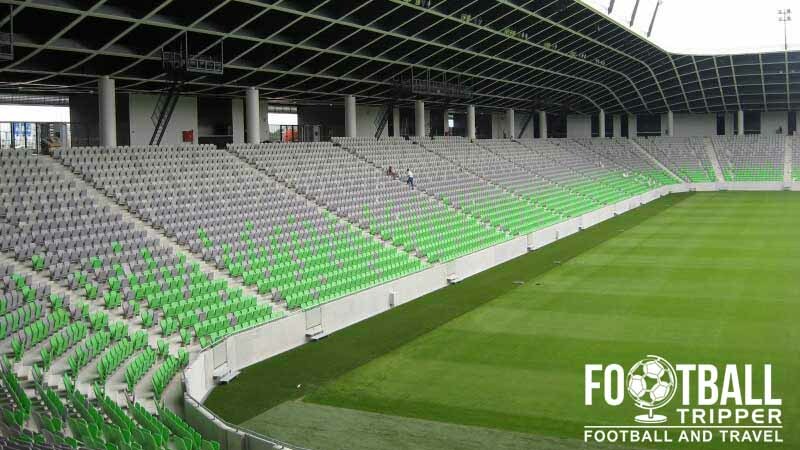 Stadion Stožice is comprised of a single-tiered of continuous seating which can be divided into four sections: North, East, South and West. For international matches away fans are usually housed within central blocks 27, 28 and 29 in the south stand which are accessible via entrance D.
When England played Slovenia on 14th June 2015 in a Euro 2016 qualifier, the visiting supporters were allocated 2,270 tickets however it depends on the expected size of the travelling contingent. The city centre is a lively destination for those seeking night-life, pubs and places to eat – you’ll certainly enjoy your trip there. There doesn’t appear to be a permanent football shop open at the stadium. Tours of the facilities at Stadion Stožice don’t appear to be available right now. If this changes in the future, Football Tripper will endeavour to update this section. International tickets should always be purchased in advanced from your country’s football federation/association. There are very rarely on the day sales. 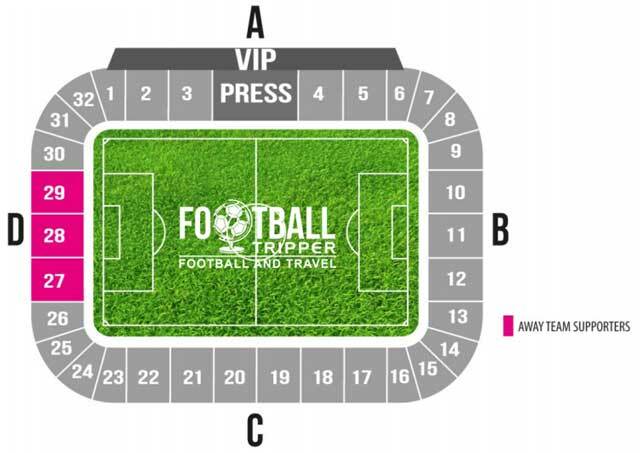 This is of course in contrast to the Slovenian Domestic League where you can pick up tickets before kick-off. Olimpija tickets are very reasonably priced with entrance costing adults €6.00, students and everyone else, €4.00. There is however a slight price increase when Maribor, the most famous Slovenian team, comes to town. Stadion Stožice sits within a wider sports park 3.9 km north of Ljubljana’s historic city centre. This means that the journey by foot is likely to take the average fan the best part of 50 minutes. As a result many fans find it easiest to catch a taxi. Slovenia’s National Stadium has a unique feel to it thanks to its low-profile and sunken architecture. There are 1,280 parking spaces in the underground car park, however we’re unable to list the matchday parking arrangements for this facility. On matchdays there is the number 13 bus service which takes fans from the city centre to Stožice Stadium’s away entrance. There is also the number 20 which has an increased frequency on the day of major events at the stadium. Ljubljana Railway Station is situated in the city center, and it sits on a line which connects Vienna in Austria, and Trieste in north-east Italy. The roof is essentially at ground level, and the walkway around it forms part of the outer concourse. Ljubljana Airport sits some 27 km north of Ljubljana city centre, and is essentially the main international airport of Slovenia. Upon landing the easiest way to travel into the city centre is via taxi, it will likely take you around 20-25 minutes depending on traffic. Less than 10 minutes west of the stadium there are a few places to stay along Dunajska cesta which runs south pretty much all the way to the train station. The most notable is the Austria Trend Hotel, however it is expensive compared to the numerous accommodation options n the city such as Hotel Center, City Hotel and Hotel Meksiko.